This two-day trip will take you on a journey of discovery to the incredible Mont Saint-Michel and two of the most beautiful Châteaux of the Loire Valley: Langeais and Chenonceau. Our air-conditioned bus leaves at 7:15 am from our agency, located in downtown Paris. A guide-interpreter will accompany you on the trip. 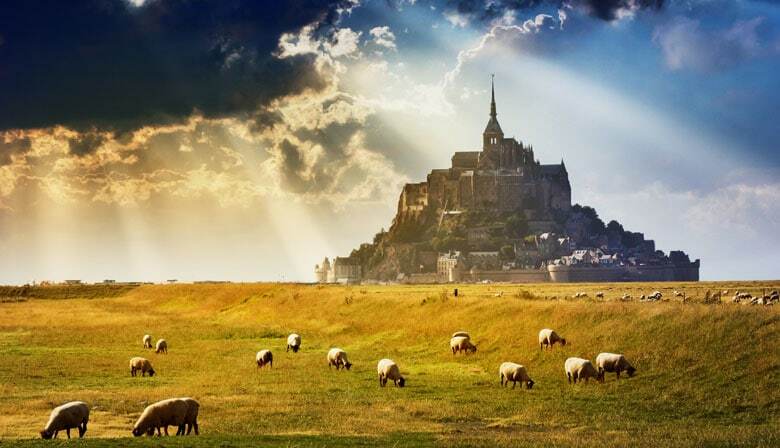 The bus takes you along the Normandy highway and after enjoying the lush green French countryside, you will arrive at Mont Saint-Michel around 11:30 am. Since you will probably be ready for lunch by then, your guide will take you directly to the Relais Saint Michel (or similar restaurant), located on the bay facing Mont Saint-Michel. There you can enjoy a relaxing meal and taste some regional specialties. After lunch, you will board a shuttle that takes you across the causeway to Mont Saint-Michel. Explore this exceptional wonder of the Western world with your guide, strolling the city walls or the Grande Rue with its many museums, shops and medieval houses until you reach the top of the mountain and the Mont Saint-Michel abbey. The guided tour will introduce you to this Benedictine abbey that dates back to the 8th century. Dedicated to Saint Michael the Archangel, the building boasts incredible Gothic architecture. Explore the refectory and the one-of-a-kind garden overlooking the sea. Then, take in the breathtaking scenery and the magnificent view of the Mont Saint-Michel bay as you make your way down along the city walls. You could also choose to stroll the village's narrow streets, stopping to pick up a souvenir or to sample a delicious crêpe. The bus leaves Mont Saint-Michel at 4:30 pm for Angers (about 2.5 hours away) where you will spend the night at the Mercure Lac de Maine (or a similar hotel). You will find many restaurants near your hotel to have dinner. After a good night's sleep and a delicious breakfast at the hotel in Angers, the bus will set off for the Châteaux of the Loire Valley. The bus makes a brief stop near Château d’Angers so you can view the exterior of the medieval fortress. The guide will also tell you about the castle. About one hundred kilometers away lies Langeais, where you will enjoy your first tour of the day. Follow your guide inside the structure, which is made up of two incredible châteaux. Take in the oldest keep in France (constructed around the year 1000) and the Château de Louis XI built in 1465 while you experience French history through depictions made with highly realistic wax figures. The guided tour of Langeais is followed by a chance to enjoy lunch on your own in Amboise, about 45 minutes away. Your guide will help you choose the restaurant where you want to eat. It will take about 20 minutes for the bus to reach the next stop, Château de Chenonceau. Explore this castle that played a special role in French history and its awe-inspiring architecture built over the Cher river. It is also known as the "Château des Dames" and the guided tour will teach you about the history of this castle, built and renovated by many famous French women, including Diane de Poitiers and Catherine de' Medici. You can also admire the lavishly decorated rooms whose ornaments speak to the refined way of life in France. The guided tour to the Château de Chenonceau is followed by a Wine Tasting of local wines at the Cave des Dômes in Chenonceau. You will be immersed into the raffined gastronomy of the Loire Valley. The bus is scheduled to return to our agency in Paris around 9 pm. In the case of a booking requiring a single room, a supplement of 65€ will have to be paid at PARISCityVISION agency prior your tour departure. - For a booking of 3 people: you will be in a double room and a single room. In that case, you will have to pay the 65€ extra upon the departure. Triple rooms are unavailable.